While browsing SparkFun one day I noticed they were selling this BarePaint Conductive Pen: https://www.sparkfun.com/products/11521 and I tried really hard to resist buying it, but eventually gave in. So now then the question was, what should I make with this thing. 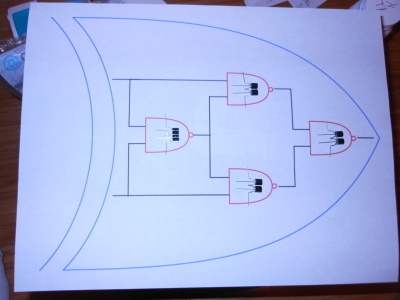 After giving it much thought I decided to make an XOR gate made from four NAND gates made from two transistors. So my transistor of choice here is a 2N7000 MOSFET. I was originally going to use a PN2222, but decided a MOSFET may be easier since I could skip the resistor on the gate. 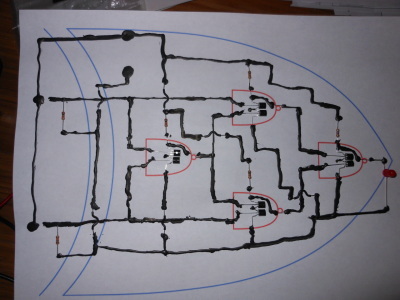 I started out by making a drawing of a kind of schematic using Dia and printing it out. After bending and cutting some pins on the the transistors I laid them down on the printout (as shown in the first picture below) and put a dab of the conductive ink on each of the pins so it would dry and attach the transistor to the paper. 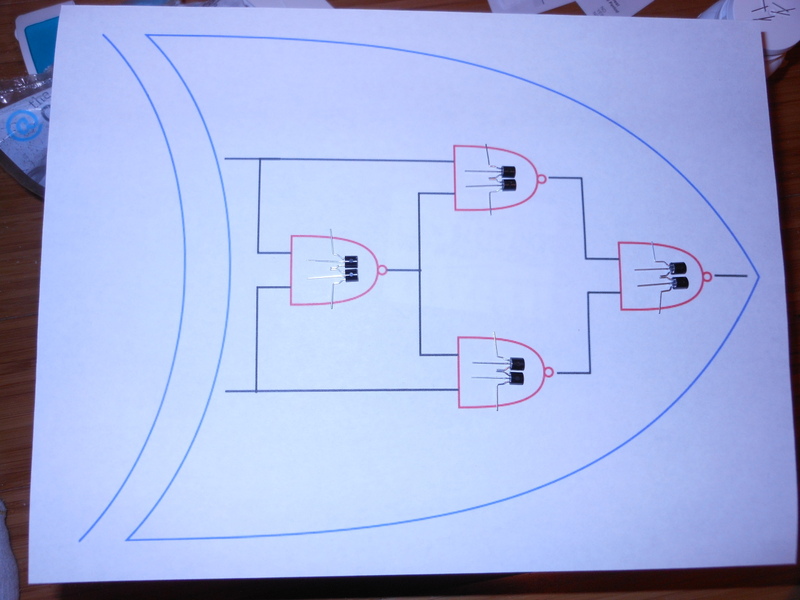 Next I put down the resistors and drew the rest of the lines. I originally tested this circuit on a breadboard with a 3v source and it worked fine, but for some reason on this circuit it wouldn't work with a CR2032 coin battery. 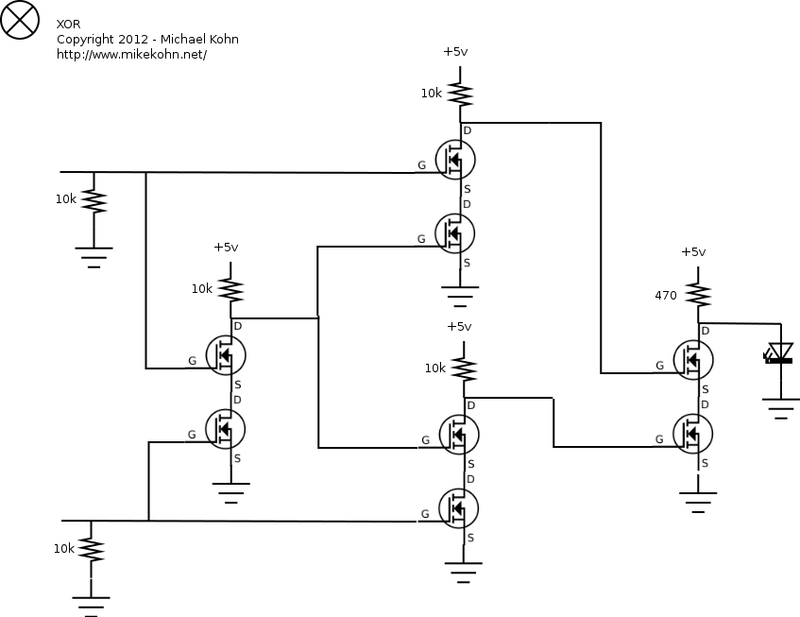 I switched to 4 NiMH AA's and it worked just fine. 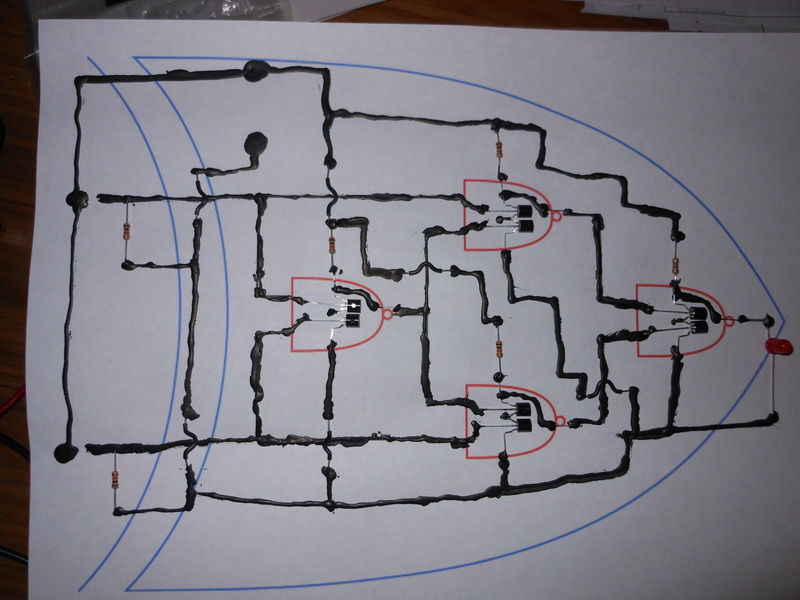 One thing I noticed that would have been useful to know before starting, the conductive paint does have pretty high resistance. 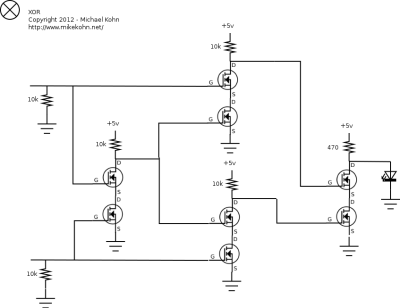 The ground wire on the bottom of the circuit was reading around 1.6k ohms. Here we are with the printed circuit and two 2N7000 MOSFET transistors laid out in each NAND gate and ready to be inked up. Here's the whole thing all inked up and ready to go. Not as pretty as I wanted it to be, but it works :).